I am so excited to bring a new segment to the blog for 2016. One of my goals for the blog this year is to create new and exciting content for you along with some of the most popular content I focused on last year. Some of you may have already heard the good news through social media. I have been trying to keep it a secret since November. I have been throwing hints out there since, but no official announcement until two weeks ago. I will be working with NOW Foods as an ambassador for 2016! This company and their products play a HUGE role in my health, weight loss, and fitness journey. I've used their products for almost a year and I have been hooked on this brand ever since. I can't wait to share with you my favorite products that I have been using and new products that I have never tried. NOW Foods adopted a natural/non-GMO commitment. This is one of the many things I love about NOW. They provide natural, high quality and affordable dietary supplements, sports nutrition, natural foods, and personal care products. They believe that high quality nutrition should be accessible and affordable to those who seek it. There is so much more behind this amazing company. You can click HERE for the full story behind NOW and their amazing practices, beliefs, and products. Today I'll be discussing some awesome products that I just can't be without. That's right... amino acids!! I'll discuss which ones are my favorite and what's available from NOW. Ok... time to get a little sciencey... is that a word? Anyway, amino acids are molecules made out of hydrogen, oxygen, carbon, and nitrogen atoms (and a little sulphur). Amino acids are generally used by the body for protein synthesis and/or as a neurotransmitter. I am sure you are wondering what the benefits are of taking certain aminos. They have all kinds of benefits to keep you at your best. There are only 20 amino acids deemed necessary for human health. These amino acids are grouped into three categories - essential, non-essential, and conditionally essential. NOW has an amazing break down of the different types of amino acids, which can be found HERE. NOW offers a variety of forms and potencies. While I love to work out and really push my body, it definitely takes it's toll. One way to combat post workout fatigue are aminos. Using aminos can result in a significant reduction of muscle breakdown. BCAA's play a number of key roles in the repair and growth of muscle tissues. They are the building blocks of muscle tissue and protein. I include amino acids in my regime to maintain muscle while losing fat. A lot of people say that it is hard to build and maintain muscle while you are losing weight at the same time, but it's been proven time and time again that it can be done. Genetics definitely plays a role in this. You will lose some muscle during weight loss, but it doesn't have to be a significant amount if you know what to do to maintain a good amount of it. L-Carnitine plays a vital role in energy production within our bodies. It helps your body to utilize and burn fat more efficiently for energy. 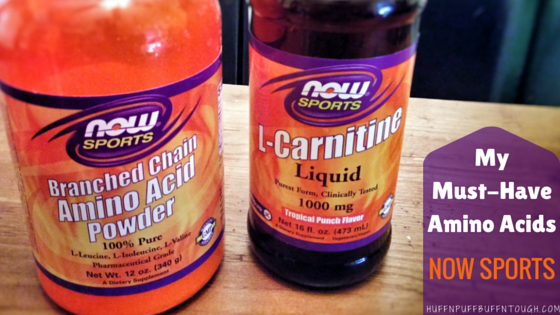 To learn more in-depth information about carnitine, you can click HERE. I have recently begun to use L-Carnitine in the tropical punch flavor. This was the first time I tried tropical punch. Up until recently I've been using the citrus flavor, which is ok, but definitely not my favorite. I tried the tropical punch and I am in love with it. It's like taking a shot of a tangy tropical punch adult beverage! The only thing I dislike is that it's not offered in the 32 OZ bottle like the citrus. They also don't have it in the 3,000mg triple strength formula. They only carry a 16 OZ bottle for the tropical punch in 1,000mg. When using ANY kind of supplement for weight loss, muscle gain, etc... you still have to put in the work with healthy eating and exercising. The supplements won't magically make you lose weight or gain muscle while having an unhealthy diet and a non-existent exercise regime. They are just tools to help your body do it more efficiently. The fun part!!! 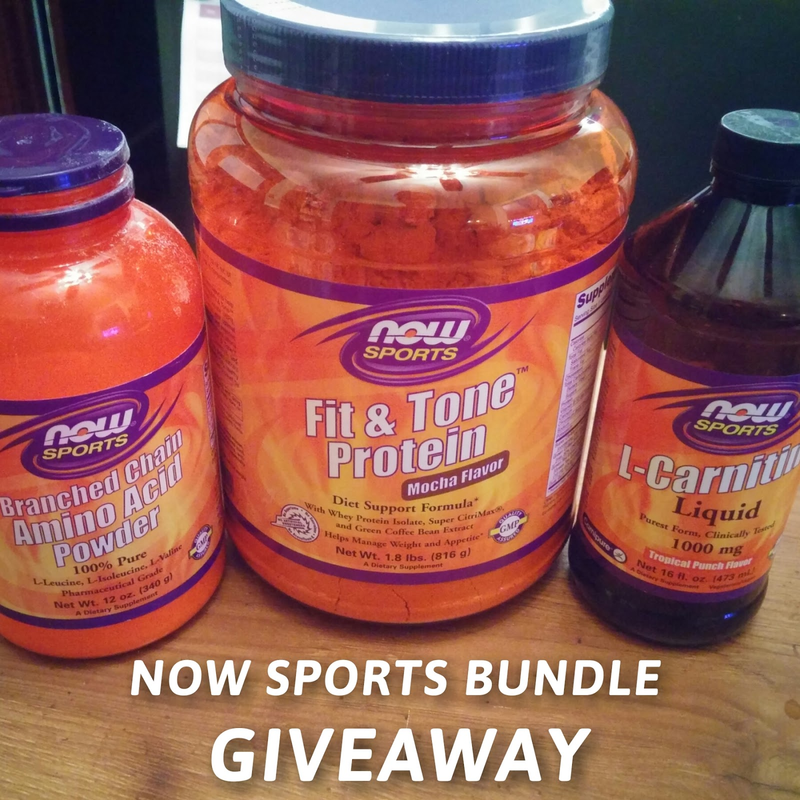 NOW Foods and I have teamed up to bring you this awesome giveaway! Enter for your chance to win a NOW Sports bundle with a few of my favorite products! The giveaway ends on Friday, January 29th at 11:59 PM CST. I love to refuel with now foods ! I love Now! Ive always been a fan of their food products, natural oils, and sports products! I have seen their fit and tone protein on Instagram and would love to try the mocha flavor most! YUm! My favorite Now Sports product is the BCAA powder. I love Now! The L-Carnitine is probably my favorite. That is an awesome giveaway! I would love to try these. I have never tried any sports products before. My hubby uses supplements when he trains so I will have to see if he is familiar with any of these and if we can get them in Canada. I have tried this brand before....and have had great results with them. I am trying to be more healthy so this is really awesome. I must look into these more and learn what I Can. The amino acid blends are my favorite product. The Fruit Punch liquid looks like a great option. 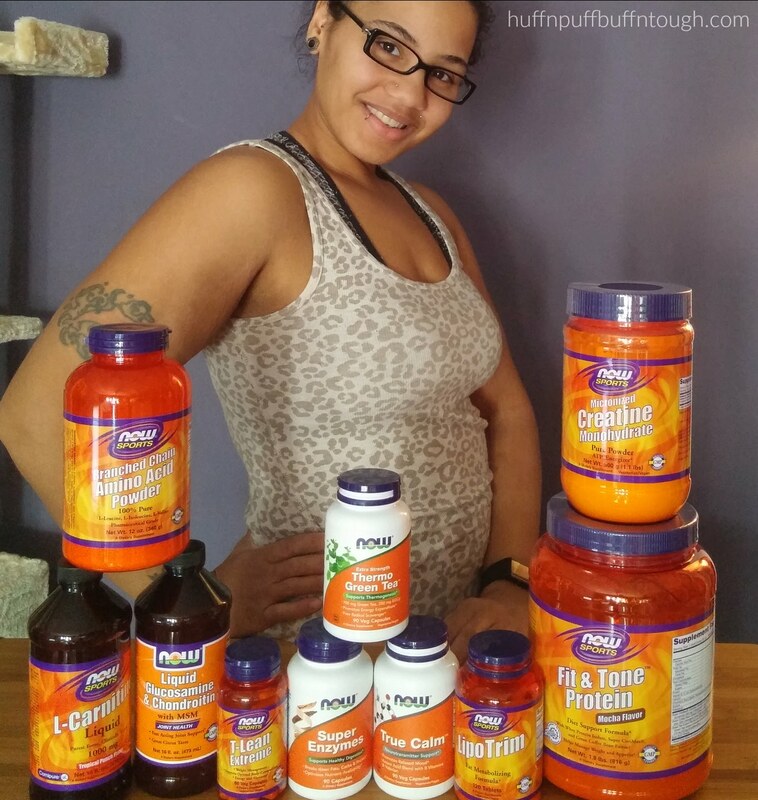 Supplements can really help get your body and mind on track to a healthier you. I would like to try the Fit & Tone Protein. Congrats on the Ambassadorship! These look like great supplements. They are so important. I take L-Carnitine and surprisingly it's helped with my energy level. Kudos to you for working on getting fit! My favorite Now product would be the Fit and Tone protein! Congratulations on being an ambassador for NOW & your 'get healthy' journey. 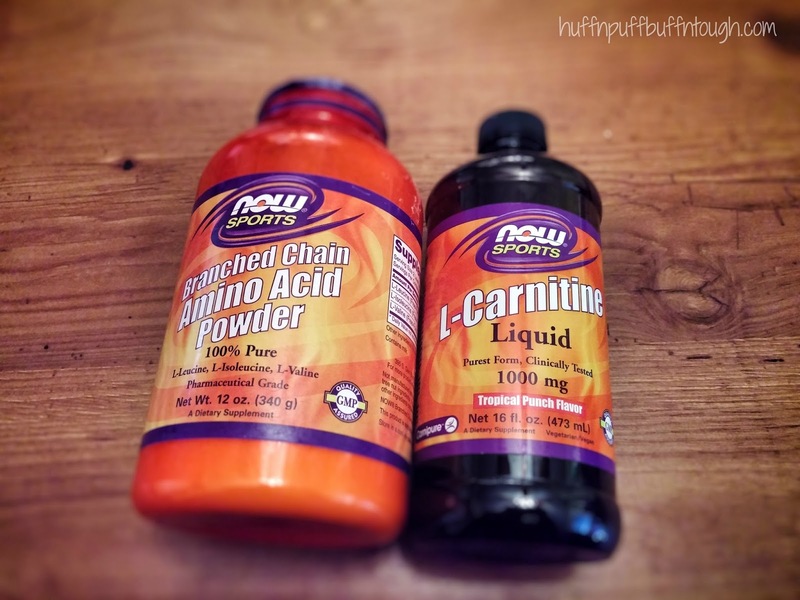 The L-Carnitine looks like something I need to try. I have been reading a lot lately about the importance of proper amino acids in one's diet. Thanks for filling me in. I am not familiar with this company or its products. This post was interesting and made me want to research amino acids. You really can learn something new every day if you try! New blog goals are fun. Good luck meeting all of your objectives. Looking forward to see what is coming. Yes, they are! Thank you!! Thank for all the info! I admit I am not that familiar with vitamins and dietary supplements. Not a problem! Thank you for reading! I want to learn more about things like this. Proper nutrition is important. Thanks for the info. The fruit o inch looks good. Ah! I love that we are both from Illinois. Congratulations on being a Now Ambassador, so lucky! I love Now and I use most of their Essential Oils, have a couple of the oil diffusers, and I cook with the Avocado oil, but I have not yet had the chance to use any of the Now Sports products. They all look amazing, but especially the L-Carnitine. Vanilla Toffee pea protein, l-leucine powder, and those sesame sticks! !